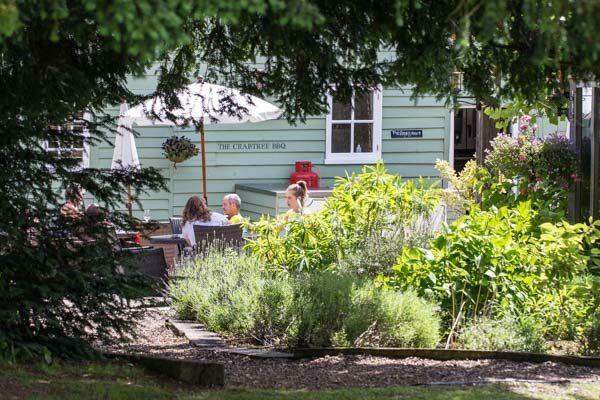 The Crabtree is a stunning family-run pub set in the beautiful Sussex countryside, just south of Horsham, serving locally-sourced, seasonal food, organic wines and real ales. It is open daily from 10am so you can pop in for coffee and treat yourself to a scrumptious cake made by Sian the pastry chef or, if you fancy something a little healthier, you can try a cleansing, raw, cold-pressed juice. Every Tuesday is gourmet burger night, with a choice of burgers, chips and selected drink for just £12 (booking advised). It is also a great place for private dining and parties. Getting married? Why not have your wedding here? 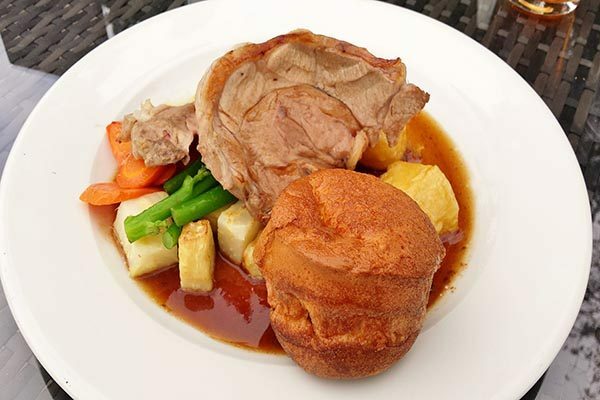 At The Crabtree they genuinely pride themselves on using local, sustainable ingredients and a creditable 90% of their food comes from Sussex alone. It’s all listed on the website too so you can even find out where that succulent lamb or juicy tomato on your plate actually came from. Talk about traceability! They serve a comprehensive list of great European wines including organic, biodynamic, vegetarian and vegan wines. 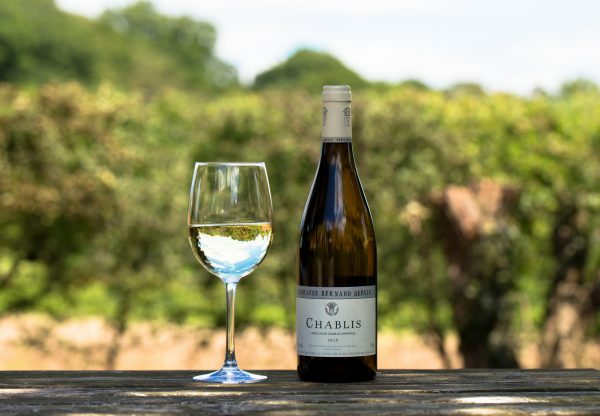 And, of course, no self-respecting British wine list would be complete without a couple of cuvées from the fabulous Ridgeview wine estate in Sussex, renowned for their award-winning English sparkling wine. Real ales come from the Badger brewery in Dorset among others and they serve a good selection of cider, spirits or whatever else tickles you fancy. 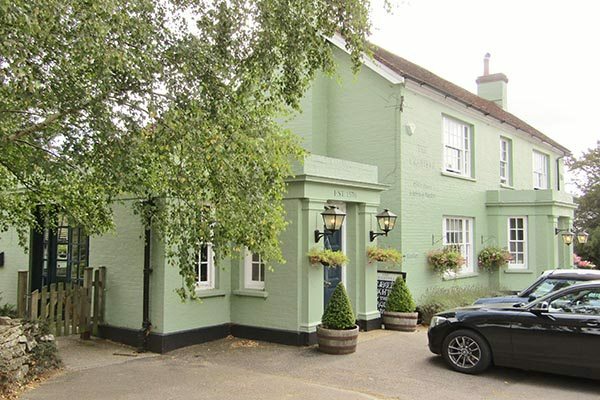 This historic pub, first established in 1576, has a warren of charming separate dining areas each with their own distinct character, from bright and modern to cosy and cottagey. Some areas are dog friendly so you can visit with your furry companion if you wish. Outside there is an absolutely vast and beautifully-tended garden. Someone obviously really cares about this lovely lush green space and you get the impression that every bit as much attention is paid to the outside as to the inside of the pub. Again there are different areas to suit everyone. 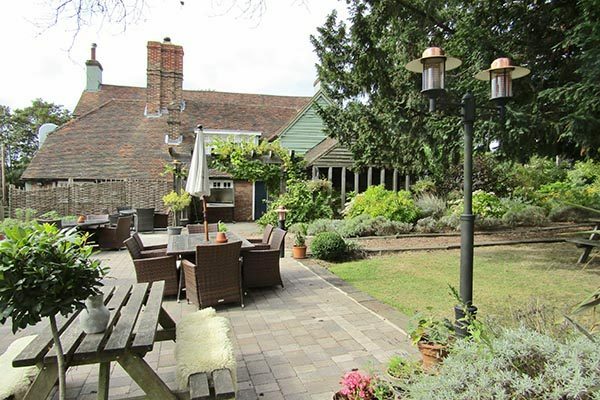 There is a huge, traditional, lawned beer garden for your casual pint with friends. There is a play area with rope swings hanging from a grand old tree and a very swanky Wendy house, modelled on the pub itself. Around the corner is a rather more up-market courtyard with comfy garden furniture and benches covered with genuine sheepskins (for the more discerning bottom) and in the corner, by the kitchen, is a sweet little herb garden used by the chefs. There is even a large field out the back where you can wear out your dogs before you eat. Needless to say, the pub is popular with walkers and cyclists alike and a great place to go with a young family. We were initially seated in the pretty little conservatory but as the sun was out we asked to be moved to the courtyard and the friendly staff were happy to oblige. We took a moment to breath in the fresh air and take in the beautiful surroundings then we set about placing our orders. To drink Andrew went for a pint of Badger’s Fursty Ferret, a fruity, hoppy, pale ale and I had a glass of Cirò Bianco Greco an absolutely gorgeous Italian white wine, silky smooth, light and sweet and dangerously easy drinking. When our starters arrived they looked incredibly inviting. The food was plated with great care and was popping with tempting colours. We couldn’t wait to dive in. 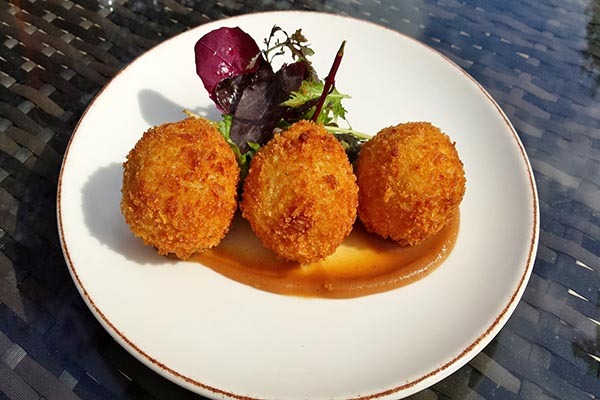 Andrew started with the crab arancini, golf ball sized, sticky rice balls delicately flavoured with crab and coated with a fabulous, crunchy, golden crumb. They were served with a rich, sweet, apple purée and a handful of crisp, dressed salad leaves. 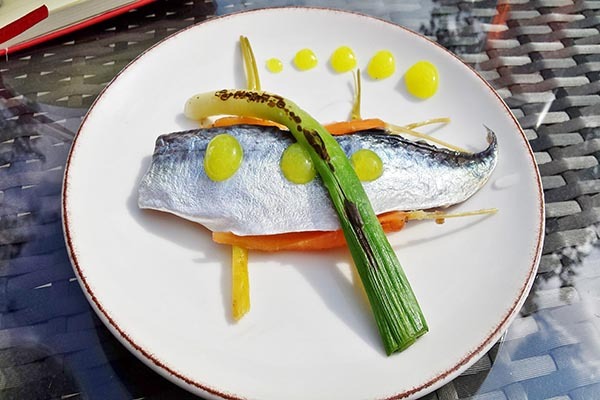 I had the cured mackerel, lemon gel, baby leek and carrot escabeche. I got a whole cured fillet of mackerel with positively mirror-like silver skin glistening in the sunshine. Now call me a wuss, and I don’t know what I expected, but I did find a whole fillet of essentially raw fish a little intimidating and I soon learned not to try to eat that beautiful skin because it was a bit tough. That said it was impeccably fresh and unarguably “of the sea” and the firm, salty, chilled flesh was strangely refreshing, perfect for a hot summer’s day. Dots of neon yellow lemon gel bought some sweetness to the plate, and the slivers of tiny, subtly pickled carrots and the lightly charred baby leek were lovely. 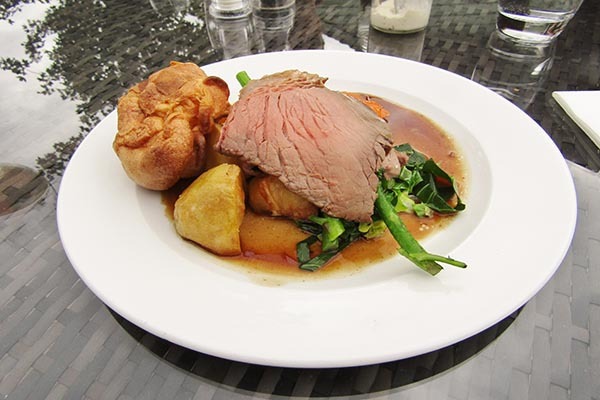 For our mains Andrew opted for the roast leg of lamb and I chose the roast rump of beef. Andrew’s lamb was truly melt-in-the-mouth tender and my beef was pleasingly pink in the middle and they were both delicious. Our meat was accompanied by a selection of perfectly cooked, colourful veggies including sliced carrot, delightful little cubes of celeriac, sprouting broccoli and golden roast potatoes. We also each got a crispy Yorkshire pud and a light, tasty gravy. My horseradish sauce had a good kick to it and Andrew’s mint sauce was delicious and beautifully fresh. For dessert Andrew had the apple and rhubarb crumble. 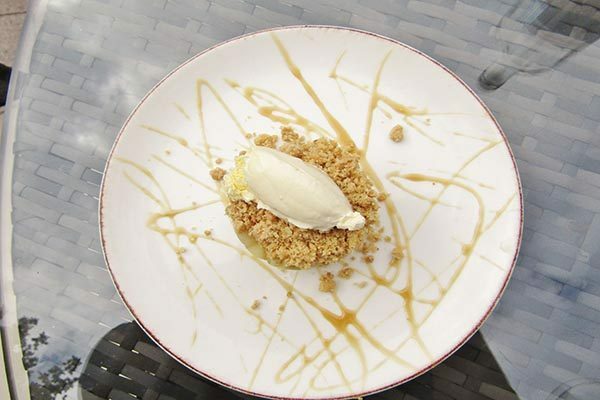 A little circular tower of soft, stewed apples dotted with little pieces of rhubarb, topped with a sweet, crunchy crumb and a quenelle of thick, indulgent clotted cream, all artfully decorated with squiggles of salted caramel sauce. 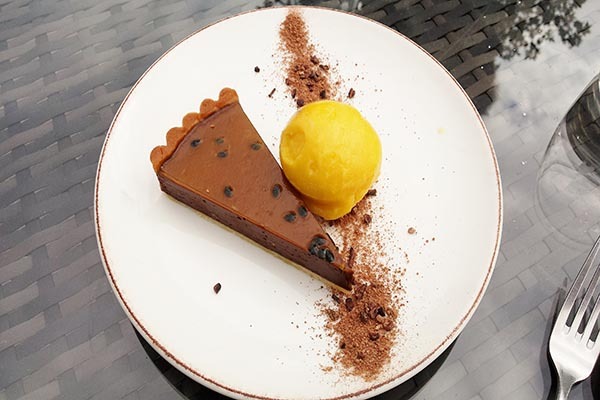 I had the passionfruit glazed chocolate tart with passionfruit sorbet. A wedge of rich, dense, dark chocolate ganache, which delivered an intense cocoa hit, on super thin pastry, glazed with glossy passionfruit gel. The sorbet that came with it was lush! It was sweet, impossibly zingy, refreshing and utterly yum. The dish was finished off with an artistic line of chocolate soil and crunchy cocoa nibs for good measure. 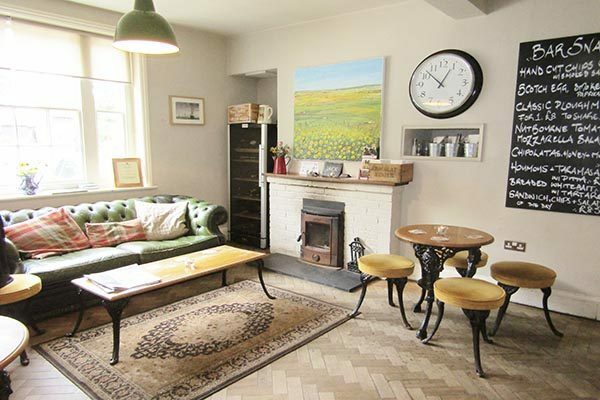 What an absolutely charming place to enjoy a slightly more exotic take on your traditional pub roast!